The ICP Education Grant Program (EGP) The Education Grant Program is funded by the International College of Prosthodontists Education and Research Foundation and administered by the International College of Prosthodontists to support a broad range of global education programs in the field of prosthodontics. The ICP Policy for Advancement of Scholarship is directed at supporting prosthodontic related education programs through the Education Grant Program (EGP). The education programs should be directed at young or early career prosthodontists. 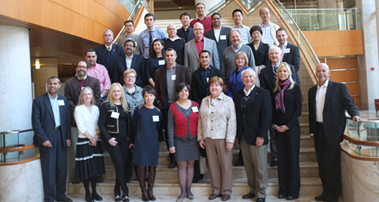 The intent of the ICP Policy for Advancement of Scholarship is to promote and nurture global education programs that serve to advance the knowledge of early career prosthodontic educators, academics, clinicians and leaders in areas related to prosthodontics. Applicants must be ICP members (student members are not eligible). The grants are intended for established educators with a proven track record in dental education of other educators, academics, clinicians and leaders. As such, individuals are eligible to apply to the EGP provided the individual submitting the application is a member of the ICP. Awards will be granted on merit and are subject to a maximum grant of $15,000 USD for any application. Scholarly education quality. Merit is also attached to prosthodontic education that will enhance the visibility of the ICP which values high quality global education. A proven record of delivering high quality education programs with documented participant feedback attesting to the track record of applicant effectiveness. Relevance to a broad range of potential participants. The applicant must have additional co-sponsorship in place from associated institutions and/or corporate entities that confirms that the proposed program will be completed successfully. Funds must be used exclusively for the purpose of the specific prosthodontic education program and must not be directed to other institutional education programs. The members of the ICP Education and Research Committee selected by the Chair of the Committee will constitute the Selection Committee. A full review will determine whether the proposed program meets the educational mission and objectives of the ICP. The ICP Board of Councilors will receive the recommendations of the Education and Research Committee members and will make final award decisions. Funds may be requested for a wide range of prosthodontic education. A full description of the course content as well as the course objectives and outcomes is to be provided. Funds may be requested for a start-up education program as well as a mature program with a history of success. A full description of the outcome measures to assess relevance and benefits of the program that meets the ICP's goals will be required. An agreement from the program promoter that both entities will share information and review cost-benefit report following the education event. A plan from the program promoter exists for continuation of the program beyond the initial program sponsorship application. While each request will be reviewed on its merits, this is a criteria in the application for funding. Agreement from the education program promoter that preference is given to participants who are ICP members. Agreement from the program promoter that recognition of the ICP sponsorship be provided, e.g. display of the ICP logo along with oral acknowledgement. An agreement is provided that following conditional approval of co-sponsorship, no funding will be disbursed until other (industry) co-sponsorship has been committed and validation of such sponsorship is supplied. Applicants should submit proposals on the prescribed application form. Respond to all items on the application form. 6. If this program, or a substantially similar program, has been run before, participant feedback in the form of anonymous survey participant responses related to the learning objectives of the program should be submitted for review. Prior to completing the Application Form, please download and review the PDF file EGP Rules and Regulations. The ICP Education Grant Program is a development of the ICP Education and Research Foundation, allowing the ICP to continue our mission...The International College of Prosthodontists internationally promotes the specialty and discipline of prosthodontics.